Do you ever get in a breakfast rut? I sure do. Probably because I love it so darned much. It is without doubt my favorite meal of the day - I embrace all things breakfast. 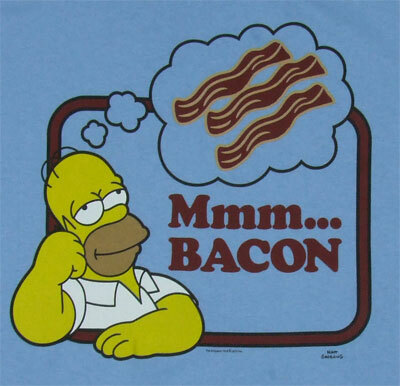 Bacon. Oatmeal. Bagels. Sausage. Pancakes. Cream cheese. French toast. Waffles. Strawberry jam. Omelettes. Grits. Syrup. Biscuits. Bracks and I even have brinner (breakfast for dinner) on a pretty consistent basis (or, at least we used to before this whole "health kick" thing started). It's been quite an adjustment having to compromise my favorite meal of the day in order to live a healthier lifestyle. I miss being able to indulge in the items mentioned above whenever I wanted. I miss snagging that extra piece of sizzling bacon. I miss heaping cream cheese and strawberry jam on a toasted everything wheat bagel (a truly incredible combo, by the way). I miss justifying massive stacks of blueberry pancakes smothered in syrup and butter as somewhat healthy because "they have fruit in them." My morning smoothies have been my go-to for the past few months, and while I love them and have found ways to change them up (stay tuned - I am dedicating a future post to a bunch of the variations I have been loving lately), sometimes I want something more substantial, too. A liquid breakfast, though quite tasty and full of nutrients, sometimes makes me feel like I've ingested less than I actually have, meaning I get hungry for lunch sooner and my urge to snack throughout the day increases exponentially. It was clear to me that my smoothie-for-breakfast infatuation was fading, and fading fast. It was back to the drawing board - I needed to find a new way to enjoy a hefty, delicious breakfast that would keep me sated and satisfied, while maximizing healthiness and minimizing calorie and fat intake. I thought I was dreaming an impossible dream. My new favorite go-to takes about three minutes (if that) to prepare in my kitchen, and on days when I'm really in a rush, the cafe downstairs in my office can prepare it for two dollars and change. Not too shabby. no veggies in my eggs in this one, oops! 1. Spray olive oil cooking spray (or your non-fat cooking spray of choice) on a non-stick frying pan, heat up the pan. 2. Add the peppers/onions, saute for just about a minute. 4. Stir with a wooden spoon until properly scrambled and combined. Serve all of this on a plate with the turkey bacon/sausage and an assortment of fresh fruit (my current fruit of choice is red grapes). The best part is that this whole meal (I'm talking eggs, turkey bacon, and fruit) is only TWO WW POINTS+. TWO!!!!! It's three points if you go with the sausage over the bacon - but still. Three points for a huge breakfast is pretty legen...wait for it...dary. I always, always, always put Texas Pete on the eggs. Always. 0 points+. I pair the meal with a Bizzy's breakfast smoothie when I'm not running late in the morning. I sometimes put a few spoonfuls of jarred salsa on top. Most brands are 0 points+ (if there are no corn, beans, or cheese in them). My two favorites: this and this. Or, if you so choose, you could make your own! Since I keep a ton of spinach around for my smoothies, sometimes I saute spinach instead of peppers and onions. I had about 1/2 cup of leftover enchilada filling after making Valerie's chicken enchiladas over the weekend, so on Sunday morning I heated it up in the nonstick pan and then added the egg whites. I still paired it with grapes and a smoothie and counted the whole thing as 5 points+ (I did not serve it with turkey bacon/sausage since I had already had my poultry fix). Mama Bracks gave me some great spices from Penzeys, so sometimes I shake in a sprinkle or two to add a kick to the eggs. My current favorite is Arizona Dreaming. So, there you have it - a healthy and low-fat way to satisfy your craving for a popular breakfast dish. As for the other breakfast items listed above, it's not the end of the world to indulge every once in a while. It's a matter of monitoring your portions and keeping it all in (drumroll, please) moderation. I hope you enjoy this breakfast as much as I do, whether you have it for breakfast, lunch, or brinner.